This is one of my favorite portraits and I have to applaud Chelsea and Tuck for getting up before sunrise and meeting me out at the ocean's edge. I was so excited to be shooting this session - it was my first LBGTQ shoot and I was so honored to be trusted with their love story. For this image, I had Chelsea and Tuck stand down at the edge of the water. Shooting with a very wide lens set down in the sand, I was able to make the sand look like beautifully textured dunes in the foreground. The colors of the sunrise were so vibrant and beautiful and by allowing the couple to go into complete silhouette, the image becomes even more dramatic and colorful. After this shot we did many more images both at this location as well as in their beach house, a local abandoned castle which was turned into a state park called Atalaya. It's one of my favorite locations to shoot in Myrtle Beach. I would so love to shoot a wedding there. Location: 6001 S Kings Hwy, Myrtle Beach, SC 29575. 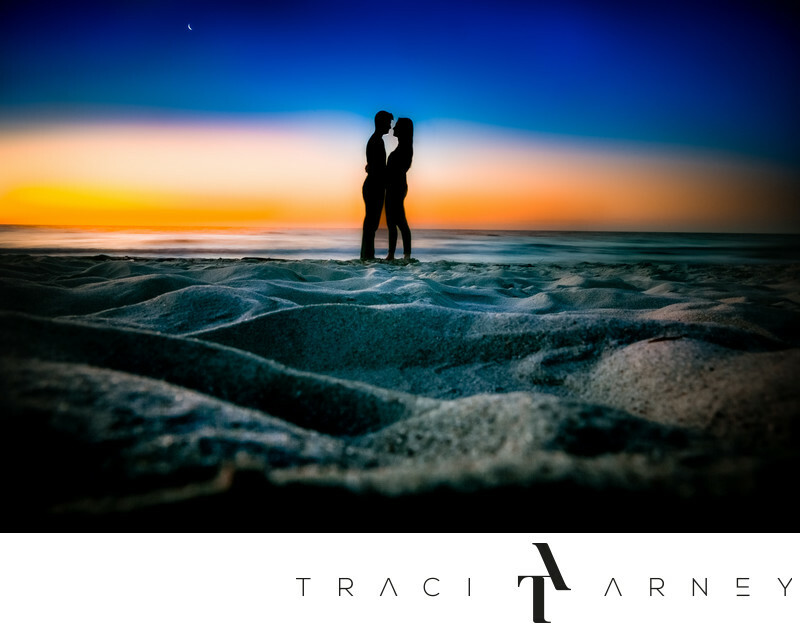 Keywords: Beach (12), Coast (6), Lesbian (3), Myrtle Beach (36), Ocean (9), Portrait Session (24), Romance Session (87), SC (33), Silhouette (57), Sunrise (6). 2.5; f/20.0; ISO 100; 24.0 mm.